Just like with eating, drinking can present many challenges for kitties with cerebellar hypoplasia. Their wobbles and head tremors can lead to spills and some “swim” sessions, but there are several things you can do to help. Accidents and messes are common with CH kitties, but there are things you can do to help them become more capable water drinkers — as well as making any clean-up easy! You may end up playing a large role in helping your kitten drink, depending on the severity of her CH. This could range from initially having her drink from a small animal water bottle to holding her head and body still while she drinks. Either way, if she’s very young, you’ll most likely play a role in her basic needs for the first few weeks. Once your kitten is a few weeks old, watch her carefully to see if she can get to where she needs to go. Chances are if she’s not making it to the litter box on time or eating often, she’s not drinking enough water. Help your girl out by providing regular drinking sessions. 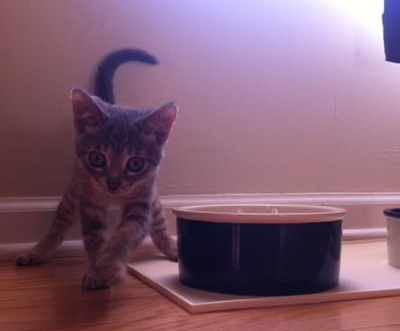 Since some CH kitties have trouble focusing or aiming while drinking, try to buy wide, heavy bowls. The wide diameter will make it easier for her to drink without bumping her head, and the heaviness will keep her from knocking the water bowl over. Metal bowls are a good option, but heavier ceramic bowls may be a better option. The trouble with many cat dishes is that they are actually quite small in diameter and volume. Instead of shopping in the cat aisle, I actually suggest heading to the dog aisle, where you can find a wider range of wider products. Depending on your pet’s ability, it may be helpful to raise the food and water dishes. Your cat will not have to bend down as far, and consequently may not lose her balance as often. Underneath your water bowl place a mat of some sort. I suggest something with a lip on the edge that has a non-slip texture. While I hate to promote a $10 pet place mat, I actually found one at PetSmart that I’m quite happy with. Martha Stewart’s new line at PetSmart features a pet place mat that fits the bill. It has a slight lipped edge and is made of silicon, which prevents it and the dishes on top of it from scooting around. However, the options for a pet place mat really are endless here. An old hand towel can even do the job nicely. One last tip: Keep some old towels near your cat’s water dish, just in case. You never know when your kitty will take a tumble and you’ll need to dry her (and your whole floor). It makes the clean-up process just a tad less hectic if you don’t have to leave the scene to grab a towel. Whether they mean to or not, sometimes you’ll see your CH kitty approach her water bowl from all angles. Keep this in mind when you put down her water bowl and food dish, and instead of placing the two a few inches apart, place them about 18 inches apart. That way, if your kitty tumbles into one, her next flop won’t throw her into the other. Provide fresh water daily, if not more frequently. The freshness will entice your kitty to drink more, especially if it looks like someone went for a “dip” earlier. Thank you for posting this information. My wife and I foster for our local animal shelter and we are trying to work with our first CH kitten. My CH kitty has done really well walking as she gets older (when she was younger, it was a different story, one that ended up with her dragging herself, covered in poop, into my bed each morning!). She is probably almost two years old now and gets around quite well. Although her head wobbles a bit when she drinks, the real problem is that the CH that affects her motor function also seems to effect her drinking – every time she drinks, she aspirates water into her lungs. She’s got a constant lung infection that antibiotics doesn’t seem to cure because she is constantly exacerbating it. I’ve tried a ton of different things – raised the water bowls, lowered the water bowls, flowing water, still water, different types of bowls. Everything works for about a week and then we’re back to square one. I’m going to try a hamster bottle and see if that helps, but any other tips would be greatly appreciated! Did you try the hamster water bottle already? Recently, I adopted a severe CH kitty and I am having trouble with her drinking. I am feeding her chicken morsel in gravy. I fill the bowl 2/3 food 1/3 water. However, cause of wobbling most of the water ends in the floor. I am afraid she is not getting enough water and was thinking about a bottle. If you tried it, do you have any recommendations? I think this page was very helpfull. I just got a kitten with ch yesterday and notice he was having a hard time drinking so I am currently bottle feeding him waterbur was trying to find another way for him to drink while I am at work. He is one of the greatest kittens I have and I am proud to help inform others around me to help save kittens an cats like him from being put down. I have 4 CH kitties ranging from Moderate to Severe and they all have challenges with drinking. My most severe also has aspiration issues. He doesn’t do well with any type of liquid. He is on a wet food diet so that he gets lots of moisture with his meals and I have also added water to the food on occassion just to give him a little extra. He tends to tolerate this very well. PLEASE HELP! I have had my CH kitty for 2 1/2 years. She was about one year old when I got her. I would say she has a moderate to severe case. She cannot really walk, just flops around with one or two steps in between but does so successfully. Up until a few weeks ago she ate and drank just fine. No assistance needed. She scooped out her kibble onto the floor and also straight into her mouth. She also went to the water dish by herself and drank like the cat in the video above. The problem started a few weeks ago when I noticed that she was losing weight and was dehydrated. I had not seen her eat or drink but I’m not always home. She has been to the vet and has had blood work, x-rays, an enema (was constipated from the dehydration), went to the neurologist and no one seems to know what is going on. I have been helping her eat wet food and am also giving her sub-cutaneous fluids. To me it seems that she is having more difficulty eating and drinking which seems neurological but the vet says there are no problems with her jaw, tongue, mouth, etc. As we know, CH does not get worse or better, it stays the same. So, why would she have more difficulty if that is indeed the case? We did move into a new house but she was doing okay for a few weeks after we got here and then she stopped. I would appreciate anyone’s input. I am very worried about her. In addition, Belle went blind about a year ago from cataracts. While it is uncommon for a four year old cat to get cataracts, it is probably due to her congenital abnormalities. Not sure if this is relevant. That’s interesting. Does your vet have any ideas why? Her blindness shouldn’t be connected to CH in any way, so there may be another neurological reason why. I’m sorry to hear about your kitty! I wonder if she got into something/ate something that made her sick? Another possibility is that she may not have CH, but something else. But that would likely impact her mobility, not her desire to eat/drink. I would suggest taking your vet’s advice and help your kitty take it slow. Perhaps some wet food or meat flavored baby food will help hydrate her a bit and get her appetite going. Good luck and keep us posted! Thanks Amanda for your reply. You’re right she does not have any other mobility issues. Everyone is stumped. I’m just going to keep going and see what happens. If she is not getting better in the next week then I’ll take her for an abdominal ultrasound. The last step would be an MRI but money is the big issue there. I will keep you posted. Thanks again. Great! I’m glad you found the suggestions useful! This is really informative! ^_^ I’m going to try that. Possum is a year old and is a moderate CH cat. He had distemper as a baby and has adapted quite well over the last year. Drinking was a challenge though. He would either turn the bowl over or end up soaking wet when trying to drink water. I foster kitties for a rescue group and after having to dry kittens and clean water bowls several times a day I finally got a Drinkwell pet fountain. Now everyone has fresh filtered water without me having to refill water bowls all day. Possum loves it. It has a wide base and is very sturdy and the water pours out the top like a waterfall. Possum can sit up and drink from the flowing water instead of bending over to lap water out of a bowl. No more soaking wet kitty! My guys refuse to drink from still water. We have a small fountain. Shiver, the one of three CH guys I have, plays with the stream before he will drink from it. I’d like more info on using a small animal water bottle for kittens. Video? Hi there – great question. I’ll do some research and post more on this soon! I have a four week old baby, very tiny, rescued from a horrible shelter situation. She had a seizure this am and has had every parasite known to kittens! She has received sub Q fluids twice since last Thursday. The vet suspects cerebellum damage, did anyone who has a CH cat see seizures? I am trying so hard to help her make it, any other ideas? Thank you for the drinking ideas, she has a lot of trouble drinking. Our little Typsy has severe CH. the day after we rescued her we took her to a vet who only sees cats. on the way to the appointment tipsy had a seizure which was quite bad. We were giving her diazepam when she would seize which would help immediately, but she continued to have ‘ticks” which would be followed by a seizure. Our vet recommended and MRI and spinal fluid tap, so we went to Washington State University Vet hospital (great people there by the way), and found that she has a fluid sac pressing up into her little head, and a very small cerebellum. She is just about done with her steroid therapy and is currently taking Phenobarbital 2x daily which has eliminated her seizures. The seizures we have been told by our primary vet and the head of the neurology dept at wsu are not a result of the CH as seizures are caused by the frontal brain. you may need to consult with a neurologist for your little one. today is day 12 with no seizures and no ticking for typs, we will find out next week what course of medication she will need as the phenobarbital levels should be at operant levels. good luck to you! My ch puppie absolutely will not drink in her own. We have to syringe water her. Any suggestions on how to fix this? She’s about 6 months old. My CH kitten won’t drink water. At all. I have to add water to her wet food. I’ve tried chicken stock, tuna water, KMR, everything I can think of, she will sniff it but won’t drink. So frustrating! any luck with some of those cheap dollar mini ice cube trays? i was putting a few down in the wet food before she would eat it. she wasnt drinking water either. i was giving her gravy lovers (fancy feast, and the gravy would over lap the icecubes. and the icecubes would absorb the flavor of the wet food so even when the wet food was gone she kept coming back to the ice cubes.) hope this can help some? my year old CH plus cataracts plus deformed sternum and joints eats kitten kibble slowly. I figure he will need to be “dish fed” as long as he lives. He drinks water from a large metal mixing bowl, as long as the level of the water is about an inch from the top.His wet food is blended,warmed and poured into one of those cheap old desert dishes you can get at Goodwill…I hold it at the right angle for him to lap while the little bum lolls around in his bed!! He regained and maintains his weight after a sudden drop a couple of months ago.He and I have both figured out a lot of stuff together, and he is doing much better.The vet took a look at his oropharynx( with sedation) and removed a large amount of mucous which was causing the problem,(hiccoughs, sneezing and reverse sneezing.) Just putting him out to feed and drink was not enough, and most likely will never be, but meal times are now down to about ten minutes with no messes.Everyone who has met him says he is a sweetie!! Good luck! My severe CH kitty, Maga, doesn’t drink water. The only way I am able to hydrate her is by adding some water to her food. However, I don’t think its enough what she is getting, most of the time she spills the water out. Has anyone tried a rabbit or hamster water bottle? If so, please, let me know. I truly need some advice. I found when my fuzzybutt doesn’t drink from his fountain and is feeling rough, that I can use a baby medicine syringe or a pet syringe (the kind without a needle and with a fairly large diameter opening) to push water, drop by drop, into his mouth. They don’t take much, maybe a teaspoon or two, once or twice a day depending on their size (kittens obviously take less). It takes patience, and at first they probably won’t like it, but they get used to it. Doing this saved my sweetie’s life when he was having a fever of unknown origin. Now when I get the syringe out (I keep it in the silverware drawer in a separate section, and keep it cleaned regularly so it can be ready for use at a moment’s notice), he looks at me and lifts a paw as if he’s begging for a sip! I noticed that you didn’t mention using a water fountain instead of a bowl. I found that my possibly-CH cat doesn’t like to drink from bowls, no matter what kind, but he loves drinking from a fountain. I have a PetSafe filter fountain that sends the water in a waterfall from the top, so the water is aerated, and it lands in a bowl. He drinks easily from the waterfall and loves it (even though it sometimes makes a splatter with the force of the water falling onto his tongue), and often he’ll sit by the fountain and sip, so he can keep his balance better. Yes, he does occasionally play with the water in the bowl, but mostly he drinks from the waterfall. I found that I needed to use separate waterproof trays beneath the fountain and beneath his food — I keep them separated so the water doesn’t splash over onto his dry kibble. The Martha Stewart pet line that you mentioned has good ones that are a decent size, and protect my wooden floors from getting waterlogged or stained with his occasional dribble of wet food at dinnertime. AND they’re easy to clean! Our CH baby snorted in water when deinking and had chronic URI because of ingaling the water in his lungs. We purchased a rabbit watter bottle and taught him. It made all the difference when he was a kitten. Now he drinks fairly well from a bowl. Oh my word my phone makes me sounds horrible. I’m so sorry if you dont understand I can rewrite it. I have discovered silicone rubber bowls and dishes for my little guy Ziggy. They come in all shapes, sizes and depths and eliminate the risk of chipping teeth. Ziggy has severe CH and is very spastic, so he has chipped teeth on some of his earlier dishes (he is my first CH cat, so it’s been a learning curve for both of us!). To prevent tipping, I made a PVC pipe frame and filled it with BBs or small ball bearings for weight, then covered it with rubbery pipe insulation. The bowl rests snugly inside the frame and the weight keeps it steady. He also uses the padded frame to rest his head/neck on while drinking since he does this lying down and it helps steady him. Hope this helps!